From box office major hits to independent cinematic brilliance, Austin and the surrounding Hill Country has provided the landscape for filmmakers to bring their vision to life on the big screen. 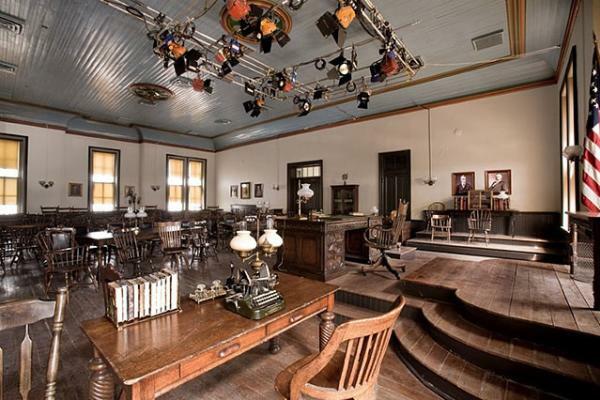 Of course, "Dazed and Confused" and "Texas Chainsaw Massacre" are some of the most talked about titles, but there are many more favorites filmed right here in central Texas. Make sure to check out these locations on your next visit to Austin. Saint Mary&apos;s Cathedral. Credit Arlen Nydam, Nydam Photography. Robert Rodriguez’s "Machete" lacks no shortage of action; an ex-Federale (Danny Trejo) launches a brutal rampage of revenge against his former boss when a plot to assassinate a Texas Senator (Robert De Niro) goes very wrong. The historic Saint Mary&apos;s Cathedral of Austin on East 10th Street sets the scene for a calmer moment in the film when Machete asks for assistance from a priest in the confessional booth. You can visit this impressive church any day of the week but make sure to call before visiting as it’s sometimes closed for private events. The gift shop is open every day from 11 a.m. – 2 p.m.
A teenager (Hailee Steinfeld) enlists the help of a U.S. Marshal (Jeff Bridges) to help her track down her father’s murderer in a trek across the Texan frontier. You wouldn’t think Austin could provide the perfect location for a 1903 Memphis street scene, but Joel and Ethan Coen did just that. The small-town vibe came alive at the Millett Opera House, known now as the Austin Club on Ninth Street. 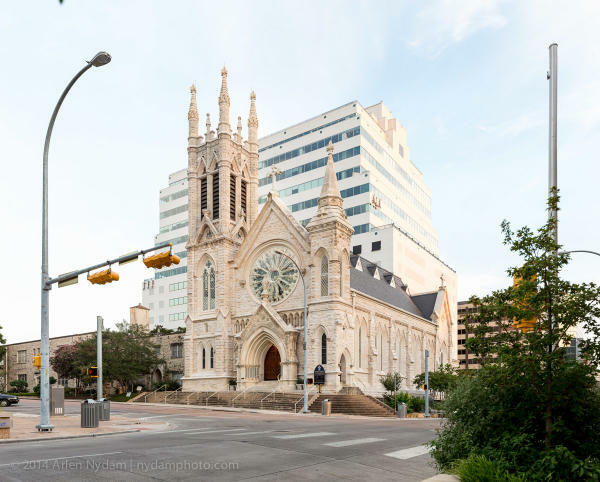 Built in 1878, the exterior created the perfect setting by removing stripes from the pavement and filming careful angles to avoid capturing the Austin high-rises. Despite being a private club, you can snap some great photos from the street of this grandeur building. 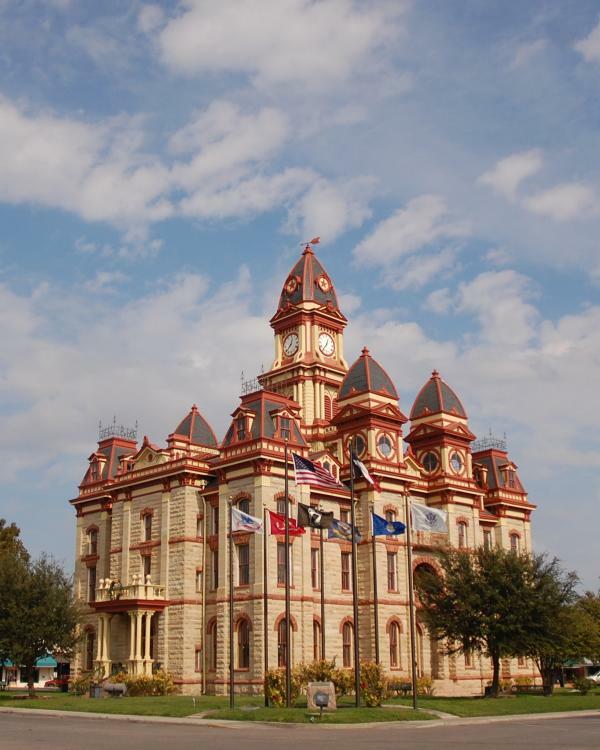 If you’re looking to head west and explore a little bit of the Texas Hill Country, stop in the town of Blanco, which set the scene for this western including its Old Blanco County Courthouse and town square. While in Blanco, make a day out of it and stop at the Hill Country Lavender Farm or the Buggy Barn Museum, followed by a drink at Real Ale Brewing Company. Caldwell County Courthouse. Credit Adrian Gutierrez. In this 1996 comedy, barbecue capital Lockhart, Texas doubles as small town, Blaine, Missouri. With much to see and eat, and a favorite day trip for many Austinites, Lockhart provides an afternoon full of barbecue and location scouting. As you head into town, make a stop on North Pecos Street to view the silos used in many shots early in the film. Then head south towards Main Street to enjoy some of the best barbecue in the state of Texas at Black’s Barbecue or Smitty’s Market. Situated in the middle of town, off San Antonio Street, stands Blaine’s Town Hall, also known as the Caldwell County Courthouse, which appears multiple-times in the film. Lastly, head to the infamous Dairy Queen, a now empty building across the street from the Dr. Eugene Clark Library on South Main and West Prairie Lea Streets which also makes an appearance in the film. Never seen these films or need a refresher course? Check them out on VUDU or Apple iTunes. If you want to learn more about iconic films made in the area, check out our Made in Austin page!